Last month, you might remember me talking about our absence at the movie theater in the two years since our daughter was born. We’ve missed a lot of movies on the big screen in that time, which means we’re pretty much a DVD-only family now. In last month’s post, I talked about buying the pre-order version of Men in Black 3 at Walmart. The perks that come with the pre-order version are pretty sweet. Not only will we receive the DVD or Bly-ray version of the movie in the mail when it’s released on November 30, we also have access to the digital version of MIB3 on Vudu a full two weeks before the DVD hits shelves. To celebrate our early release access, we held a special Men in Black 3 viewing party at my mother’s house on the night before Thanksgiving. Watching a digital movie on Vudu is pretty simple. You can buy digital movies on the site or watch movies you’ve already purchased. What’s nice about Vudu is that it uses Ultra Violet (UV), which stores your digital movies in “the cloud” so you don’t have to put them on your computer and can access them anywhere at any time. 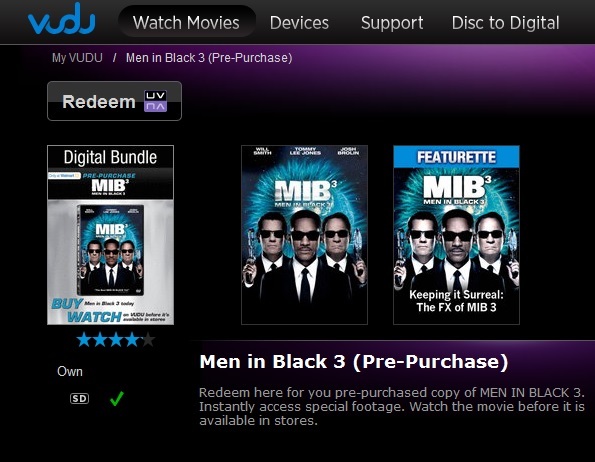 To watch MIB3, we simply accessed Vudu.com and signed in to our account. (New users can sign up here.) As you can see at the bottom of the screenshot below, you can watch movies via several methods, including an Xbox, Playstation, computer and others. For our gathering, we’d be watching the movie via our computer, which was hooked up to the TV. I know what you’re thinking: “I can barely figure out how to program the clock on my stove! How the heck will I figure out how to connect my computer to my TV? !” That’s what I thought, at least. Turns out, it’s pretty simple. 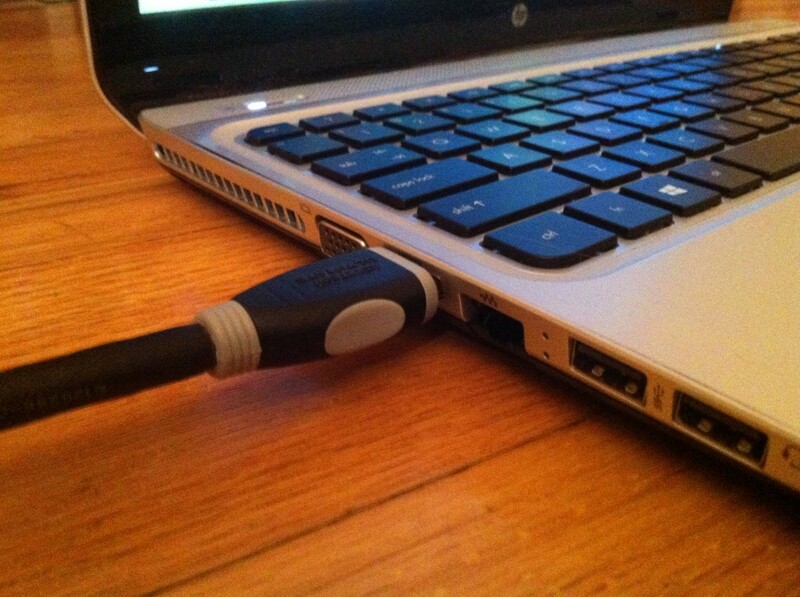 If your laptop and TV both have an HDMI connection (most new ones do), you just connect them with an HDMI cable and change a few settings on your computer, and you’re all set! Once the computer was hooked up to the TV and we were logged into our Vudu account, we clicked on “My Vudu” to access our previously purchased movies. 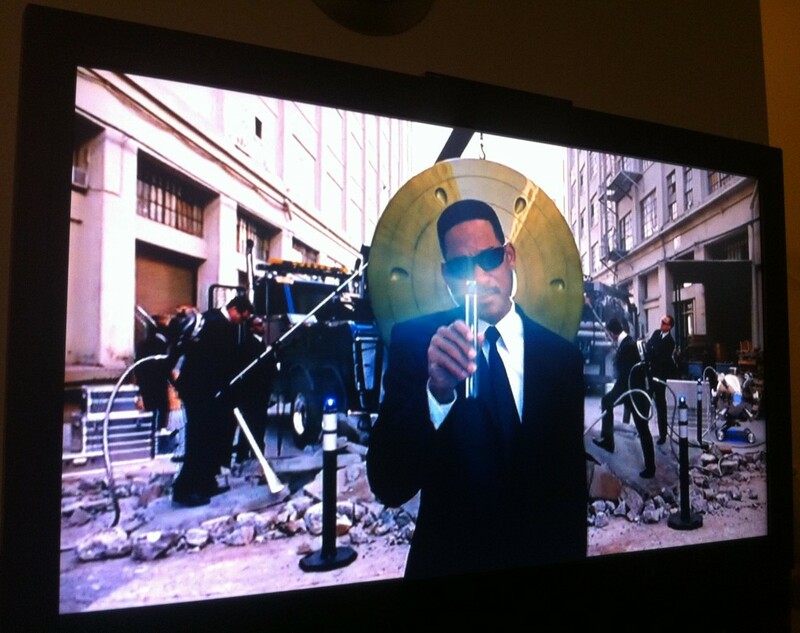 Like magic, there was Men in Black 3 – ready to be watched! A few clicks later, the movie had started, everyone found their seats, and we were ready for our Thanksgiving Eve movie night. There were about 12 people on hand for the Men in Black 3 viewing party. Seen here are some family and friends who gathered around to watch the movie. Oh, I almost forgot the best part. Sure, we’d be eating more than our share the next day, but we couldn’t watch a movie without a few snacks (plus the pumpkin pies cooking in the oven were making us all pretty hungry!). To feed our appetite, we popped some popcorn (of course!) and dished out some ice cream for those of us with a sweet tooth. It’s show time! So what did everyone think of Will Smith and the gang as they battled all sorts of extra terrestrial villains? As fans of the previous two MIB movies, we all loved it, of course! And now that they all saw how easy it is to use Vudu, they’re all fans of the watching digital movies online, too. For more information, check out Men in Black on Facebook or Twitter, or visit the MIB3 section of Vudu.com. thats really neat! going to check it out on xbox! How cool is that!!! I haven’t heard of Vudu and must check it out 🙂 I haven’t seen MIB3 yet… it looks like I need to! This is a really neat idea. I love being able to watch the movie before others. Great post. We love seeing movies before they come out. This is just such a neat idea! mmmm pumpkin pies. How long before those were devoured? So cool! Thanks for explaining about hooking up the computer to the TV. I had no idea how that worked! I love legal movie streaming. 🙂 This might be the way to go! Wow! This looks really neat! How awesome! I loved this movie, too, btw. I like things that are simple. I would rather watch a movie that way than buying it. We just started using Vudu and I love how easy it is! I joined Vudu and never even checked it out. This just reminded me I need to. I get so busy I forget and I love watching movies. I really love the hook the computer to the TV option. We do that a lot and that would be perfect for us! I think we have it on our PS3, but have never tried it. Guess I’ll have to give it a go!! Thanks! I LOVE that movie! And I love Movie Parties! Definitely need to get the family together to watch this one! And I love Vudu and how easy it is to use! I loved Men in Black III. It was better than II and up there with the original. I hope your family had a blast! How cool! I love DVDs, but not the space they steal from the living room. This is a great idea! I love the Men in Black movies. I hadn’t heard of Vudu. two of our favorite things! MIB and Vudu! Looks like you had a great movie party. I’ve heard of Vudu, but never took the time to really check it out. Adding it to my to do list! WOW! Full house there! Super fun! I want to see that movie so bad! Super cool party you guys seemed to have watching the movie! John and I wanted to watch a movie on the tv from our laptop and I just remembered you did this pat! It was very helpful! Thanks!